I didn't hear about Sydney Parkinson for a long time. Which is really amazing considering that he is one of the most important botanical and natural history artists who ever lived. His claim to artistic fame is that he sailed as the artist on Captain Cook's first journey around the world on the HMS Endeavour (1768-1771) - a voyage of historical significance and scientific discovery. Sydney Parkinson was born in Edinburgh and became very proficient at drawing plants and flowers. He then travelled to London to develop his career as a botanical artist and was discovered by Joseph Banks who was the great sponsor and developer of gardens (eg the Royal Botanic Gardens at Kew) and botanical illustration in general. the first non-indigenous artist to portray the Aboriginal people of New Zealand and Australia from direct observation. The sad thing about the botanical illustrations is that they lay in archives for years as nobody could afford to produce them as a proper volume recording the voyage. However the good news is that this finally happened more than three hundred years after the voyage was completed. In 1773, Banks employed five watercolourists to complete 595 new artworks based on Parkinson's unfinished work. 18 engravers were then employed to cut life size versions (based on 743 artworks) as botanical engravings on copper printing plates - which took until 1784. The 738 engravings they produced enabled scientific publication in colour. Various reasons meant that nothing more than proof prints were taken from the engravings while Banks was still alive - and there was no publication. Subsequently the engraved copper plates were stored in the British Museum. The British Museum (Natural History) - which is the former name of the Natural History Museum - produced lithographic prints of 315 of the Australian plant engravings between 1900-1905. In the 1980s the Natural History and the publisher Editions Alecto renovated the copper printing plates and printed the very first complete set of images in colour. You can find these links and others relating to Sydney Parkinson on my new information site Sydney Parkinson - Resources for Botanical Art Lovers in the series about botanical artists. The really sad thing about Sydney Parkinson is that he died - aged just 26 - of fever on the voyage home shortly after they ship left Java. The failure to publish in the eighteenth century meant that his name is not well known. Just think what he might have produced had he lived! To my mind it is only fit and proper that there is now an increasing level of awareness of what he accomplished on the voyage. 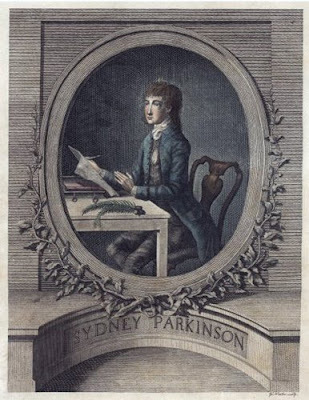 I hope with this post and my new information new site that I can help contribute to people knowing more about Sydney Parkinson and what he achieved with his work. As I've been developing my information sites about botanical artists, I've been noticing that they seem to fall into two groups - which I've identified at the beginning of A Compendium of Botanical Art. botanical artists who have been associated with exploration and discovery - such as Parkinson, Ferdinand Bauer, who also journeyed to Australia and also recorded the plants of Greece, Maria Sibylla Merian who jouneyed to Surinam in South America and Margeret Mee who lived Brazil and explored the Amazon. Tomorrow I continue with a post about Margaret Mee - an artist who generates not infrequent requests in various quarters for more information. Wonderful link (yet again) thanks, Katherine. Now I'm wanting to find out exactly how the watercoloured etchings were made. I told you I lack focus!